Britain is a place many Australians look to with fondness, with many of us having relatives there, and it being a top destination for Australian tourists. As a result, London is sometimes seen as a city to emulate, especially as our cities get bigger. Our current crop of public transport managers certainly have links to Britain — the current CEOs of PTV, Metro and V/Line are all Brits (though the current and recent Yarra Trams CEOs have been French). 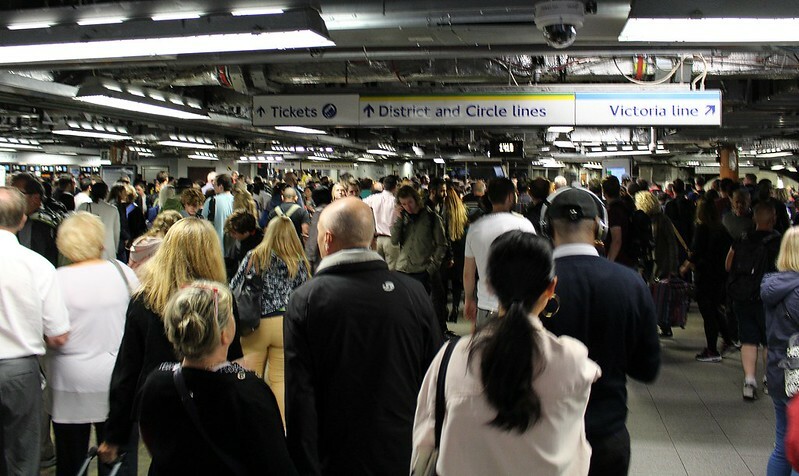 London Underground (aka The Tube) carries vast numbers of people. Could Melbourne’s Metro be more like them? 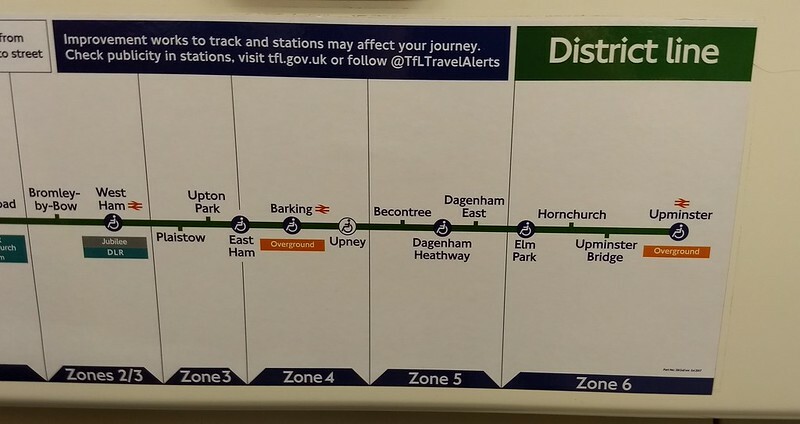 Well we seem to have copied some of the Tube map’s colours for our rail map. 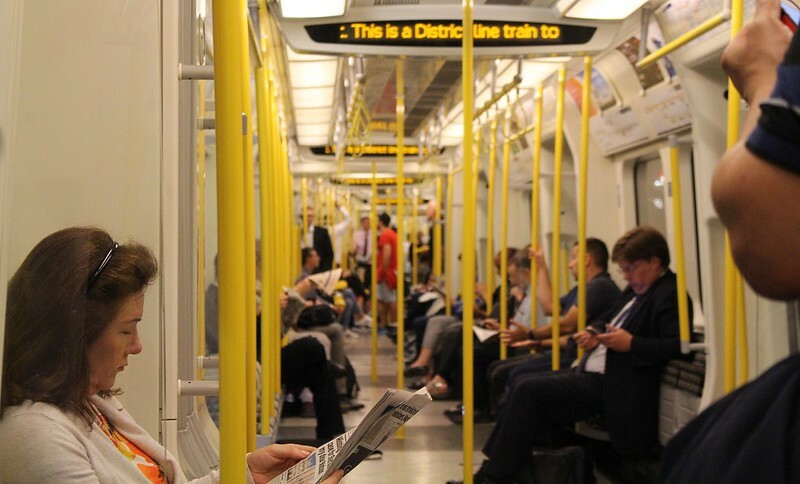 Here are some things I’ve learnt about London Underground – both from last year’s trip, from recently reading Christian Wolmar’s book about the history of the system, and from other research – and how they might relate to Melbourne. Most of London Underground isn’t underground. Tunnels are very expensive. Mostly it’s the central core of the network, where there was no other practical choice, that’s underground. Outside the central core, for the older lines, there was space to go aboveground, though recent network expansion has mostly had to go under. This map actually shows you where the tunnels are on the network. Melbourne lesson: it’s only recent new lines in heavily built-up areas that have been or will be underground: the City Loop, Metro 1 (under construction via Swanston Street) and the proposed but not funded Metro 2. Other new lines such as Regional Rail Link and Mernda are aboveground, because they’re either in new areas or along existing reservations. The popular narrative is that Myki is crap, Oyster is perfect. Oyster is terrific, but perfect? No. On our trip, most of us used credit cards; one used an Oyster card. We found we couldn’t top-up the Oyster card online, because our account was linked to a non-UK address. Instead it has to be done in person. Fares also aren’t fully integrated. You will pay extra to change between tubes, other trains, buses, trams, river boats. And we (occasionally) saw Oyster readers not working, mostly on buses. And “heritage” Routemaster buses don’t accept credit cards. That said, on all other services, the system’s terrific “contactless” capability to accept most Paypass/touch credit cards directly is a real boon for tourists. Melbourne lesson: Myki has a way to go to improve, especially with regard to reader response times. Only the new model readers are fast enough — over time this might be resolved as older equipment gets replaced. We probably won’t get credit card options anytime soon, but phone apps may be on the way. Conventional wisdom will tell you that a metro system has no branches — that trains run simple patterns from end to end. Many of the more modern metros are like engineered like this. Singapore for instance, where each line is self-contained. Even getting to the airport involves changing to a shuttle service. London Underground actually has lots of branches, which complicate operations, but are a legacy of it being such an old system. And yet they’re replicating it on the new Elizabeth Line (aka Crossrail) — a central tunnel, with two branches in the east, and three in the west. Even so, “flying junctions” and other infrastructure are used to avoid conflicts, and the interactions between lines are minimised. It helps prevent delays on one line quickly spreading to another. Melbourne lesson: there’s been a gradual shift to separating out the lines, not just in terms of timetables but also maintenance and drivers. But there’s a way to go yet. Currently in peak hour, the V/Line Gippsland and Dandenong lines share tracks, with the latter interacting with the Frankston line in the Loop, which in turn connects with the Werribee line, which (in the morning peak) also shares tracks with some Sunbury direct trains. The Sunbury line in turn shares tracks with the Upfield and Craigieburn lines, which share with V/Line Seymour trains. The Sunbury line also shares tracks with the Bendigo line, which in turn shares with the Geelong and Ballarat lines. So during the morning peak, about half the rail lines in Melbourne and beyond (and many of the busiest) are actually interlinked! Sometimes you wonder how your morning train ever arrives on time! The Metro 1 tunnel will help this when it opens in 2025, but timetable changes in the meantime would help minimise line interactions. Conventional wisdom also says that metro lines are fairly short, which is why it’s okay if carriages are designed for high capacity, with most passengers standing. The longest one seat ride on the Tube is 34 miles (54 km) from Epping to West Ruislip on the Central line, taking 82 minutes. That said, this would take you through Central London and out the other side, which is probably not a common trip. Still, a trip from Piccadilly Circus in Central London to Heathrow Airport is about 50 mins on the Tube, so there are some long trips being made. Melbourne lesson: Flinders Street via the Loop to Pakenham is 80 minutes. Some have said this is too long for trains with few seats. The new High Capacity Metro Trains will have more standing space, but with more carriages as well, and an overall slightly higher number of seats than the current train fleets. Hopefully this is a good balance between seats and capacity, so most people won’t be standing for too long. While the whole Tube network is standard gauge, different lines are built to different load gauges, in other words, how big each train is. Deep level tunnels on the older lines are much smaller than some of the “subsurface” lines, and have noticeably smaller trains. Victorian era engineering wasn’t up to the task of building larger deep level tunnels. This means the fleet is segregated, with many trains unable to run on certain lines. Melbourne lesson: You wouldn’t deliberately design it like this. It does may make sense to run trains of one type on a line (same acceleration/deceleration characteristics can help with punctuality and timetabling, and dedicated fleets running to specific depots mean easier maintenance and repairs). But you wouldn’t want this on a permanent basis, as it’s useful to shuffle the fleet around as newer trains arrive — just as is happening on Melbourne’s trams with the Cascade Plan. The term “metro” is now used around the world. It originated with the Paris Metro, which came from the original operating company name: La Compagnie du chemin de fer métropolitain de Paris (Paris Metropolitan Railway Company). It’s unclear, but some believe the company name was inspired by the London Metropolitan Railway, which had opened about 40 years earlier. Melbourne lesson: Well, you probably know this bit. In 2009 or thereabouts the State Government chose to call the suburban rail system “Metro” for the new operating contract that started that year. Yes, the government owns the name, not the operator, so hopefully it’ll stick around now. That still hasn’t stopped them partly rebranding again since then, when the umbrella “Public Transport Victoria” (PTV) brand took over from Metlink. And now we’re seeing an even bigger umbrella brand “Transport For Victoria” over the top of that, though thankfully so far that’s only appeared on printed material, not all over the system itself. Many of the stations were built before accessibility was seen as important, and 19th century engineering certainly didn’t prioritise something extravagant as ramps when building entrances to underground stations. At the time, lifts were an emerging technology, not ready for prime time. So many Tube stations are still not step-free, though they’re slowly upgrading them. Melbourne lesson: Thanks to enlightened thinking from the 1890s, and no underground stations at all until the 1970s, thankfully almost all our stations are step-free, though many are not compliant with DDA, and only some of these will be resolved via level crossing removal-related upgrades. London Underground comprises 11 lines, but numerous other railways also serve London. In the rejuvenated Docklands area, there is the Docklands Light Railway, an automated mostly elevated system runs. Privatised “National Rail” operators run services from beyond London, including many commuter routes. This causes some issues, with some long distance trains running with moderate loads until they reach the commuter belt, where they get crowded. 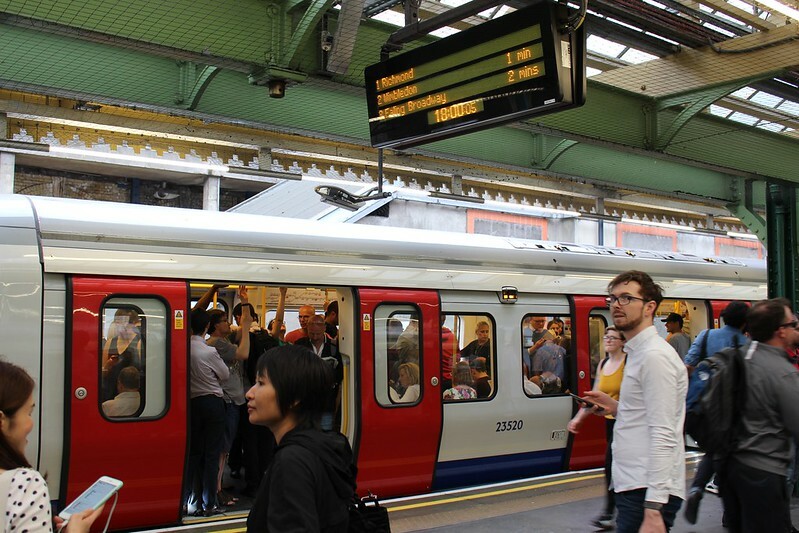 Some suburban routes have been taken over by Transport For London and are being upgraded and run as “Overground” services, offering high(er) frequencies, thus becoming more like The Tube. Melbourne lesson: The issue of long distance trains serving commuters is a well-known problem on V/Line’s Ballarat and Geelong lines, where passengers from Caroline Springs, Tarneit and Wyndham Vale (and to a lesser extent, other stations on other lines) add to capacity pressures for those from further out. There’s little question that something will need to be done to serve both demographics better. More short-run services in the short term, and better track separation and Metro services to growing suburbs in the medium to long term. Melbourne’s rail network is of course supplemented by its trams and to a lesser extent, buses. London has a small number of trams, but a very extensive bus network as well. The Tube has run frequent services from the start. 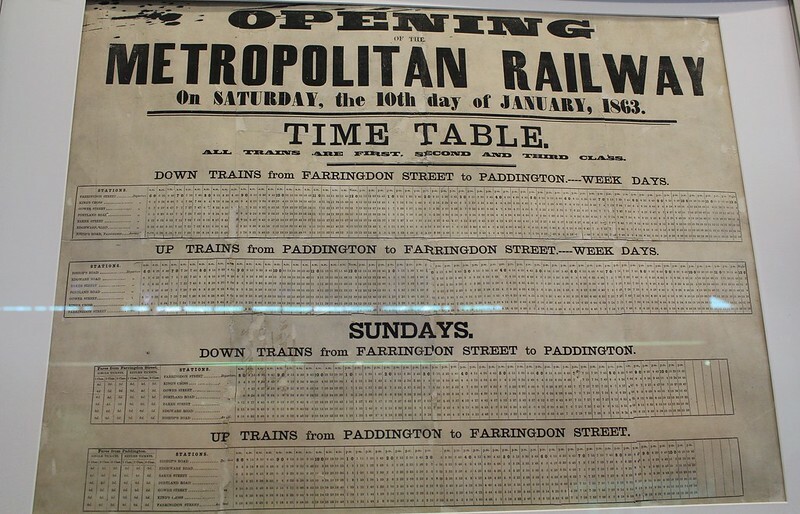 Wolmar’s book talks about 4 trains per hour on lines from day one — also shown on this timetable (above) from the opening of the Metropolitan line. This reflects that the first lines served mostly busy built-up areas, not empty paddocks. Mind you, later some lines did expand in an effort to prompt residential development. Melbourne lesson: A parallel might be the trams, many of which were built in already established areas, and were mostly reasonably frequent as soon as they opened (and still are today) whereas the trains ran farther afield, originally beyond the metropolis to developing areas, and were (and mostly still are) not terribly frequent – every 20 minutes is typical outside peak. We need to catch up. There’s huge scope to run Melbourne’s trains at least every 10 minutes all day on most parts of the network, vastly improving the experience for passengers whether it’s a one seat ride, or involves connections. Melbourne’s rail network is very peaky. The most extreme case might be the Ringwood (Belgrave/Lilydale) line, where the number of trains through Camberwell in peak hour (approaching 20 per hour) is ten times the number in the late evening (2 per hour). Peaky means we’ve built substantial infrastructure and fleet which only gets a workout for a relatively brief period every day. There are probably quite a few trains in the fleet that only run two services everyday – once every peak hour. 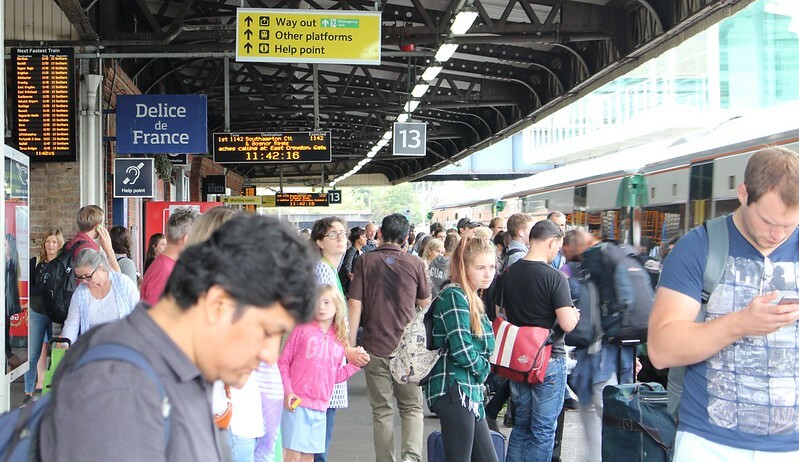 This might be a product of demand, but it also means that outside peak times, passenger wait times are much longer, which suppresses public transport demand, even though overall travel demand is strong. 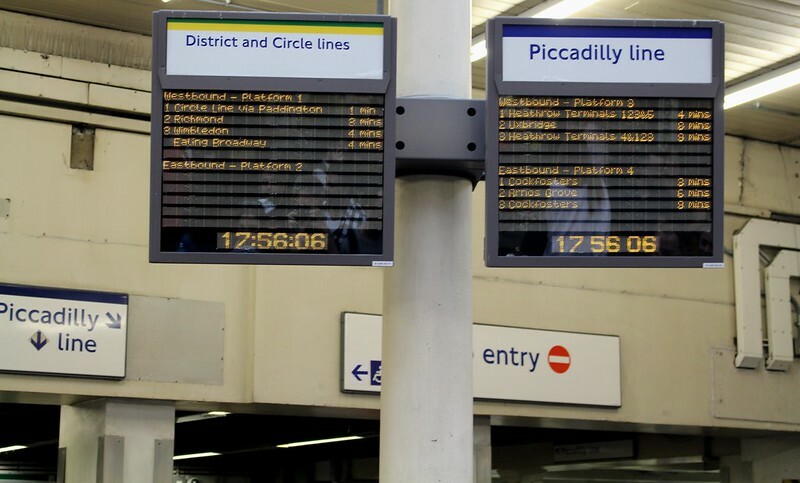 London Underground’s service, at least measured by trains per hour, is much flatter, with for instance the Piccadilly line running 21 trains per hour at most times of day, though the weekend Night Tube (overnight service) is “only” 6 trains per hour. So it’s not that London Underground is a bigger network with longer routes; Melbourne’s rail network is a similar size (but not as well supported by other related systems like London’s DLR and National Rail, as noted above). The key is that London Underground is a far more intensive network, with more frequent services, and far more passengers. It also means that unlike Melbourne, London’s system better reflects overall city travel demand, not just CBD peak hour demand. Outside peak hour, travel demand (in both cities) is substantial, but the broader Melbourne public transport network’s lack of all-day frequent service isn’t good at capturing it — trams do okay, but trains and buses (which fill the gaps) are an issue. Handling billions of passenger trips every year means making use of the latest technology. 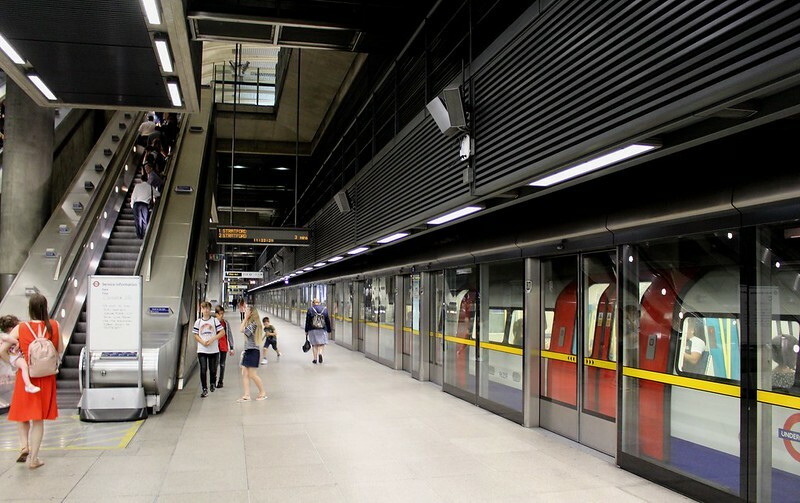 London Underground uses platform screen doors at some of the newest stations, as well as in-cab (high capacity) signalling to allow very high frequencies on the busiest lines. We’ll start to see those rolled-out when Metro 1 tunnel opens. London is a bigger city than Melbourne, about twice the population. It’s got a 1900 year head start. But Melbourne is growing fast. Our transport system needs to mature, and any sane policy should dictate that the backbone of the transport system should not be moving individuals in cars, but by mass transit. City planning will also play a role, by concentrating development around public transport. 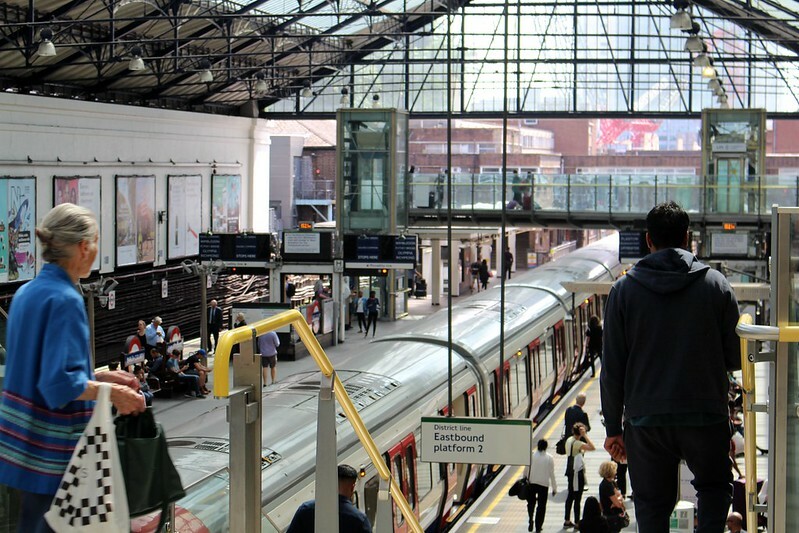 We might never have such an extensive rail network as London, but we can do a lot better than we are now — starting to adapt some of the best practices and technology from London and other big world cities would be a great start. See also from my travels: Trains and trams in Brussels and Belgium… any lessons for Melbourne? ← Previous Previous post: Is the Smartbus branding dead? Why not make every bus a Smartbus? Great article. I’m sure you’ll find London people who criticise their public transport as well – not to suggest at all that criticism is bad or just whinging. No system, even the best run, will be perfect. Flinders Street to Pakenham = 80 minutes. Southern Cross to Waurn Ponds = about 75 minutes, I think. I’d much rather do that trip on a V/Locity than a suburban train. Short services starting from Wyndham Vale basically serve three stations (maybe they should stop at Ardeer as well) currently, with a trip taking 30 or so minutes – that’s a pretty good service once you’re on the train compared to others similarly distant from Melbourne (noting current capacity and frequency issues). And noting that if you wanted to travel from one side of Geelong to the other via train (Waurn Ponds to Lara), it’d still take you about 30 minutes. You mentioned the Singapore metro line in the part about branches. In my recent trip to Singapore, I found out that the Circle line does indeed have a branch line on the downtown end of it (splitting to Dhoby Ghaut and Marina Bay after Promenade station). I am not sure if this is a permanent fixture or something that is in place until they extend or upgrade it once again. The Airport line too used to not be a shuttle, but was part of a two-route branch on the East-West line, the other branch terminating at Pasir Ris. This was not very popular back then so shortened to shuttle services, but I can see the merit of them reverting to a two-route branch service at this stage. Also, someone on twitter showed a picture of the insides of one of the newer rollingstock of the London Underground. I am really fond of the seating layout, which had the typical forward and reverse facing seats like you see in Melbourne’s trains on one side, and an inward-facing seating on the other side (much like the systems in SE Asia). I quite like the fact that it balances the amount of both standing and seating room and would like to see it emulated here. The Belgrave Lilydale line, at least as far as Box Hill or even Ringwood, is a mixed bag from a peakiness perspective. It may well have the biggest difference between the hight of the peak and the depth of the trough (1tph Night Network) and lack 10 minute inter-peak services, but it also has longer peaks, higher peak shoulder services and early-to-mid evening services than any other line and the inter-peak service (15 min) is still better (unless you are changing lines) than most lines (20 min) and bettered by only 2. It also has quite high patronage outside of peak. Very comprehensive piece. Enjoyed reading it. A couple of years ago I travelled to Hampstead Heath underground station which is 58 metres below ground level. It was built in 1907 with high speed lifts. So many stations where “accessible” over one hundred years ago. Every day there’s talk about building more politically-motivated/unfeasible billion dollar roads to the west, I’m reminded that the timetable revamp that was supposed to happen post-RRL opening (June 2015) still hasn’t occurred. There is much that could be done right now without more roads or waiting for the metro tunnel to be finished, and it would cost barely any money comparatively. When I went overseas last year, the first three areas I visited had ‘Metro’ in their public transport operator name. Informative maybe, but not very interesting or unique. The London Underground, is a network I have been following with some interest now for many years. Not quite a decade yet, but almost. Some sections of the Piccadilly line does have an hourly service, on the far end of one of its branches. One branch of the Metropolitan line is single track, or was until very recently. There is one level crossing on the network, although it is confined to within a depot. The Victoria line is unique, and in 2009, had a complete fleet replacement. The four SubSurface lines, had four lines, and five fleets of rolling stock. Today, they are all operated by the S stock. One standard fleet, to in theory operate on all lines. In reality, there are 8 car, S8 stock on the Metropolitan line, and 7 car, S7 stock on all the other lines. You can see, a move to one standard fleet across four lines, replacing five distinct rolling stock fleets. On the six other lines, the original deep tube lines, there are plans to introduce a standard fleet across all of those six lines. While the train length will vary, they will otherwise be the identical type of train on all six routes. London Underground, is moving towards, a standard network wide fleet, as far as is possible. Great article Daniel. I think that the true catalyst for going towards a London Underground style system would be Metro 2. That would mean that you would have the Werribee-Mernda Line (with the optional branch to Wollert), the Sunbury/Melton-Cranbourne/Pakenham Line, the Hurstbridge/(hopefully)Doncaster loop, the Laverton (via Altona)/Williamstown-Glen Waverley/Alamein Line; then then with a bit of fiddling, the Baxter-Craigieburn line, the Wallan-Sandringham line, and, of course, the Ringwood Loop. Assuming the completion of Metro 1, nearly the entire network could be segregated into a (miniature) London style system. After that, it would only take a few more RRLs and the whole network would be separated and could have its own fleet and operating conditions. @Arfman, thanks, I didn’t know that about Singapore. London’s seating layouts vary on different lines. Most have longtitudinal seating only, but some lines (I think the Metropolitan and/or the Bakerloo) have more seats. @Nick, yes, lots of changes to the timetable would boost services. @TranzitJim, I think you are misinformed. No station on the Piccadilly line has an hourly service. The least frequent appears to be 3 trains per hour. It makes sense if they are standardising to just three types of train. There are small parts of the LU network that are shared with the NR network. District: short section around Wimbledon. LU have the issue though of deep-level stock having to use the same platforms as larger mainline/sub surface stock. That doesn’t help the accessibility issues. I don’t feel it’s too big an issue if the branch is a long way out, e.g Dandenong or Ringwood, but more problematic when more central, e.g Clifton Hill. Re Daniel: I have checked my facts, and yes, you are correct, and I stand corrected. It does reduce to a 20 minute frequency. I must have gotten confused by the Metropolitan line, off peak Baker Street to Uxbridge which is 1tph, in addition to 7tph Algate to Uxbridge, or perhaps it was 1tph a few years back?? One of the single track routes, I think the Watford line, is to be duplicated as part of a proposed cross suburban service to Watford Junction. From your link, In fact it is not 3tph that is the lowest frequency on the Piccadilly Line, as the 3tph service between Arnos Grove and Northfields are not to the end of branch lines. The lowest frequency is 6tph, experienced on the night tube between cockfosters and heathrow. Outside of this, there is at least 21tph outside of peak and 24tph inside peak between Arnos Grove and Acton town, with frequencies split down the middle at Acton towards Uxbridge and Heathrow, and split between terminating at Arnos Grove and Cockfosters. The Upfield Line is a single track between Gowrie and Upfield which restricts the frequency to every 18-20 mins. However there is capacity to have the line run every 10 minutes to Coburg. In saying that I think it was a complete waste of time that the line had not been duplicated when the camp road level crossing was separated late last year. Having the line duplicated and running every 10 minutes can truly relieve the overcrowding on the Tram 19. Duplication of the Upfield line most likely won’t be happening until the government commits to connecting the Upfield line to Craigieburn to redirect V/Line services to Seymour/Shepparton which will allow for the Craigieburn line to have every 10 minute services to Broadmeadows. Daniel, you forgot to say if London has road tunnels and if so, when they were built. I think Vic had no road tunnels till 1998 but now the state is so corrupt that we have Domain, Burnley, Mullum Mullum, Melba and more are planned! You also forgot the congestion charge which has been in place since 17 Feb 2003 and the revenue from it is dedicated to public transport. Motorcycles and taxis are exempt. Hope couriers are exempt too! It is probably better to count the number of stations rather than compare the route km figure. I suppose the Myki thing is another load of corruption – smartcard ticketing had already been implemented in other cities before! And as you say, London allows passengers to use a credit card in place of a myki card – allowing our wallets to be thinner. I disagree that new railway lines should accommodate old trains and inefficient voltages. A brand new railway is an opportunity to have platform doors – which are much safer and in the case of Dubai, allow the platforms to be air conditioned. A crying shame that the Doncaster railway is not slated to be a brand new railway but a bastardisation of an existing railway. One notable failing of the Melbourne trains, is the terrible information about interchanging. All of the overseas metros that I have used, and even in shambolic Sydney, are incessant in reminding you where to change to other lines. Melbourne ? Zip. Travelling last week from Carrum to Glenroy, the Frankston line train unexpected went into the loop. Where to change to the Craigieburn line train ? Melbourne Central or Southern Cross ? Guessing wrong could easily waste almost an hour. It’s lots of fun, going around the loop twice ! No, actually it isn’t. It’s annoying.